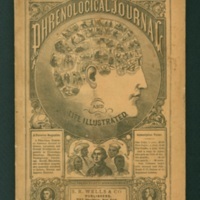 Original April 1876 copy of "The Phrenological Journal," a "scientific" magazine of the time discussing serious implications of the science of character reading through phrenology and its various techniques for reading the character of a person. 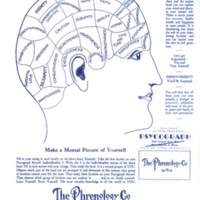 Pamphlet circulated in "theatres" advertising the tour of the psychograph machine, encouraging patrons of all ages to attend the presentation of the machine and undergo a phrenological character reading by use of the machine. 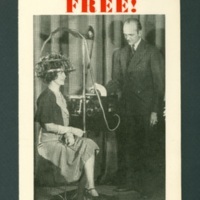 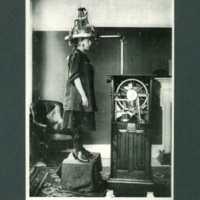 Modern reproduction of a postcard featuring a 1905 photograph of a woman using a psychograph machine on the front side of the postcard.